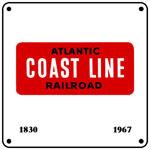 6x6" metal signs with full color railroad logos. Many rare logos that are not available anywhere else. Note that all are licensed and copyright protected. Many have been substantially reworked for a better presentation from very old images, thus are unique. 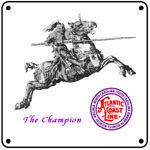 Affordable logo signs, Made In The USA. If you have a rare logo that you would like to have a 6x6 sign of, let us know and we'll swap you a FREE sign for the use of your old image. 6 inch x 6 inch square tin railroad crossing sign seen at just about every crossing. 6 inch x 6 inch square tin sign for the old time STOP LOOK and LISTEN crossing signs found along many a rail line in days gone by. 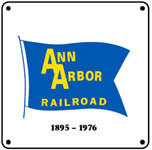 6 inch x 6 inch square tin logo sign of the AK SAR BEN passenger train used by the Chicago Burlington & Quincy Railroad before the days of the great silver fleet of Zephyrs. AK SAR BEN is Nebraska spelled backwards. 6 inch x 6 inch square tin logo sign of the American Locomotive Company or ALCO. 6 inch x 6 inch square tin logo sign of the Chicago & Alton Railroad. 6 inch x 6 inch square tin sign of the Ann Arbor Railroads red flag logo..
6 inch x 6 inch square tin logo sign of the Baltimore & Ohio Railroads famous 13 States logo highlighting the 13 Great States served by the Baltimore & Ohio Railroad, America's oldest road until it merged with the C&O to form the Chessie System. 6 inch x 6 inch square tin logo sign used by the Baltimore & Ohio Railroad until the end. 6 inch x 6 inch square tin sign of a turn of the Century logo used by the Baltimore & Ohio Railroad, mostly used in print advertising. 6 inch x 6 inch square tin logo sign of the Royal Blue Banner used by the Baltimore & Ohio Railroad. 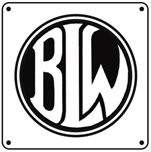 6 inch x 6 inch square tin sign of the Baldwin Locomotive Works "Group" logo. Baldwin comprised many divisions. 6 inch x 6 inch square tin logo sign of the Bangor & Aroostook Railroad, as sound as the state it served, which was the State of Maine. Click on above image for zoom. 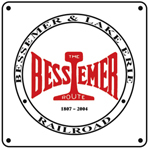 6 inch x 6 inch square tin logo sign of the Bessemer & Lake Erie Railroad. 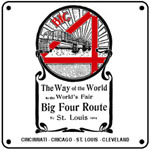 6 inch x 6 inch square tin logo sign used by the Big 4 Route, Cleveland, Cincinnati, Chicago and St. Louis, promoting their direct routes to the Chicago Worlds Fair in 1904. 6 inch x 6 inch square tin logo sign of the Big 4 Route, Cleveland, Cincinnati, Chicago and St. Louis. 6 inch x 6 inch square tin sign of the Baldwin Locomotive Works logo. 6 inch x 6 inch square tin logo sign of the Burlington Northern Railroad. 6 inch x 6 inch square tin logo sign of the Chicago, Burlington & Quincy Railroads Burlington Route image. 6 inch x 6 inch square tin logo sign of the Chicago, Burlington & Quincy Railroad with the Zephyr streamlined diesel powered train riding the logo. 6 inch x 6 inch square tin sign of the Chicago & Eastern Illinois Railroads Buzz Saw logo used after the MoPac took control of the western portion of the line. 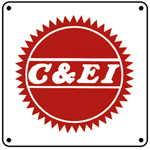 6 inch x 6 inch square tin logo sign of the Chicago & Eastern Illinois Railroad, the Chicago Line. 6 inch x 6 inch square tin sign of the Chicago & Eastern Illinois Railroads modern logos used mostly in print advertising. 6 inch x 6 inch square tin logo sign of the Chicago & Eastern Illinois Railroads Zipper Passenger train. Zipper was one of post WWII first streamlined passenger trains. 6 inch x 6 inch square tin logo sign of the Columbus & Greenville Railroad, the Delta Route. 6 inch x 6 inch square tin sign of the Chicago & Illinois Midland Railroads unique tilted logo. 6 inch x 6 inch square tin System logo sign of the Chicago & North Western Railroad. 6 inch x 6 inch square tin LINE logo sign of the Chicago North Western Line. 6 inch x 6 inch square tin logo sign of Chessie with small boy playing with his train. 6 inch x 6 inch square tin logo sign of the California Zephyr transcontinental passenger train hauled by the CB&Q, the D&RGW and the WP railroads. 6 inch x 6 inch square tin Circus logo sign used by the Chicago Burlington & Quincy Railroad.